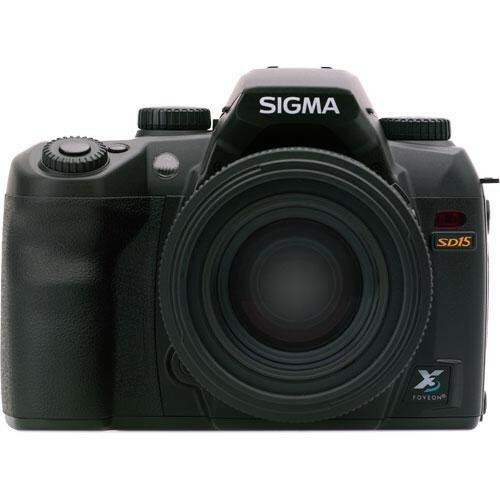 The Sigma SD15 14 Megapixel SLR Digital Camera (Body Only) incorporates a "TRUE II" image processing engine that provides high resolution power and reproduces HD images rich in gradation & 3D detail. The SD15 uses the innovative Foveon X3 direct-image-sensor that is capable of detecting red, green and blue light at every single pixel and works like photographic film. There's absolutely no loss or distortion of the optical data which is transformed into a faithful image, with no omissions. The SD15 Digital SLR camera features JPEG & RAW file formats, a large and bright Pentaprism viewfinder with 98% coverage, a built-in pop-up flash with a Guide Number of 11, a 5-point AF system, and a large 3.0" LCD monitor as well as a user friendly design. It also features a 77-segment AE sensor which provides for superior exposure accuracy. The SD15 incorporates a dual motor anti-camera shake system and ISO sensitivity up to 3200 (in Extended mode) to help deliver clear, sharp images even under difficult lighting conditions. The SD15 can capture up to 21 continuous frames in RAW mode and with the supplied BP-21 Lithium-ion battery, it is possible to shoot approximately 500 images on one full charge. Its durable shutter mechanism has a lifespan of over 100,000 cycles, and is ideal for the demands of professional digital photography. Plus, the SD15 comes equipped with Sigma's proprietary Photo Pro 4.0 software that converts all raw data quickly and easily. The Foveon X3 direct image sensor can capture all primary RGB colors at each and every pixel arranged in three layers, insuring the capture of full and complete color. Using three silicon-embedded layers of pixel sensors, stacked to take advantage of silicon's ability to absorb red, green, and blue light at different respective depths, it efficiently reproduces color more accurately, and offers sharper resolution, pixel for pixel, than any conventional image sensor. The SD15 features a new 77-segment AE sensor which allows advanced AE algorithms, improving exposure accuracy. Exact control and collaboration with the AF point ensures the camera exposes accurately even in difficult lighting conditions. The SD15 incorporates the "TRUE (Three-layer Responsive Ultimate Engine) II" image processing engine which improves the processing speed and overall image quality. The unique image processing algorithm provides high resolution power and reproduces high definition images with richly graduated tones. AFE (Analog Front End) converts the color data, which full-color capture systems record, to a digital signal. This enables the camera to reproduce high definition and richly colored images. The dedicated BP-21 Lithium-ion battery is supplied as standard with the SD15. It is possible to shoot approximately 500 images on one full charge. The battery takes about 120 minutes to fully charge with the supplied BC-21 Battery Charger. The optional AC Adapter SAC-4 enables the Sigma SD15 to obtain power from the main supply. The high-capacity battery allows photographers to benefit from the SD15's capability for continuous shooting; up to 21 images in RAW mode at 3 frames per second (fps). The SD15 adopts the SD card (compatible with SDHC) which is also used with the DP series of Sigma cameras, improving convenience to users of both camera systems. The SD15 camera features a 3.0" TFT color LCD monitor. This 460,000 pixel resolution LCD monitor benefits from a wide viewing angle, making it easy to check focusing and composition. It is possible to review the captured images with a Contact-Sheet View (nine thumbnail images), Single-Image View or Zoomed-In View (it is possible to select the magnified area by using the 4-way controller). While reviewing images, it is possible to display the detailed shooting information such as shutter speed and F-value by pressing the INFO button. The improved user interface provides faster and more convenient operation of the camera. The Quick Set button activates the display of the most commonly used camera functions such as Color mode, White Balance, Image Quality and Image Size on one screen. The 4-Way Controller ensures faster operation of these features. The FUNC button enables functions such as Flash mode and Synchro mode. The SD15 includes a RAW recording mode for retaining full image capture detail of the utmost quality plus a JPEG recording format for convenience. The RAW data format uses lossless compression for more compact, yet uncompromised, data files. The RAW data format of the SD15 keeps brightness and color data in a 1:1 ratio without relying on interpolation. Each pixel location captures the full color RGB data which, when processed in Sigma Photo Pro, will preserve the balance of the natural data for the best photos with the best image quality. The supplied image processing software of "Sigma Photo Pro 4.0" converts RAW data quickly and easily. Incorporation of a new noise reduction algorithm reduces Chroma and Luminance noise when processing X3F files taken at ISO400 or more. It is possible to adjust the level of reduction for noise just by moving the slider in the control pallet. This software is compatible with multi core CPUs, ensuring high speed image processing. It also incorporates functions such as Loupe, Slideshow, Printing, JPEG Conversion and Batch White Balance settings. The durable focal plane shutter mechanism has a life cycle of over 100,000 exposures and dramatically reduces the amount of dust and dirt from the shutter mechanism. The photographer can enjoy taking pictures without worrying about dust and dirt adhering to the image sensor either from inside or outside the camera. Most digital SLR cameras are vulnerable to dust entering the body. If the dust and dirt adhere to the image sensor, it may appear in the pictures. The mount of the SD 15 is equipped with a dust protector and the sealing parts are incorporated around the mount, preventing dust from entering the body. Even if dust adheres to the image sensor, the dust protector can be removed easily for sensor cleaning. The SD15 features a Pentaprism viewfinder with 98% (vertical and horizontal) coverage, 0.9x magnification and an 18mm eye point. A diopter adjustment is also equipped which can be adjusted from -3 to +1.5dpt. The auto focus sensor features 5 focusing points (center, left, right, up and down) ensuring consistently fast and precise focusing. The AF metering features a cross type sensor in the center of the screen. Selecting the AF point can be done automatically or manually by photographer. The SD15 is equipped with four metering modes: 77-segment Evaluative, Center Weighted Average, Center Area, and Spot. When it is difficult to determine the exposure setting due to variable light conditions, the Auto Bracketing function enables the photographer to take a sequence of pictures of the same subject at three or five different exposure levels. The shift value can be set in 1/3EV increments up to ±3EV (3 stops) or ±1.7EV (5 stops). It is possible to select ISO sensitivity value from 100 to 1600. When the camera is in the extended mode, ISO 50 and ISO 3200 can be selected. Two motor systems are driven by the mirror-drive and shutter charge which lowers the vibration of the mirror movement, preventing camera shake. The mirror lock-up mechanism raises the mirror, preventing vibration when the shutter is released. This prevents camera shake and is especially effective for macro photography or when using extremely long telephoto lenses. Use of the dedicated Remote Controller RS-31 (optional) also reduces the possibility of camera shake. The Sigma SD15 camera's built-in flash offers an angle of coverage of 17mm (equivalent to 28mm with 35mm full size lens) with a guide number of 11 (ISO 100), and can be synchronized to a shutter speed up to 1/180 sec. This built-in flash enables automatic S-TTL shooting, which allows simple, easy control of advanced photography techniques. The top LCD panel allows the photographer to quickly check camera information such as resolution setting, metering mode, battery status and the number of images that can be recorded on the SD card. It also incorporates an orange backlight, which enables the camera to be easily controlled in low light conditions. The dedicated BP-21 Lithium-ion battery is supplied as standard with the SD15. It is possible to shoot approximately 500 images on one full charge. The battery takes about 120 minutes to fully charge with the supplied BC-21 Battery Charger. The optional AC Adapter SAC-4 enables the Sigma SD15 to obtain power from the main supply. The SIGMA SD15 incorporates both RAW and JPEG image recording formats enabling photographers to capture the highest possible picture definition and small file sizes. There are four JPEG recording modes - Super High can be used for A3 (11.6 x 16.5", 297 x 420mm) or larger prints; High for A4 size (8.2 x 11.6", 210 x 297mm) printing; Medium can be used for regular size printing. Low can be used for web-page and e-mail transmission. There is also a choice of three JPEG compression levels - Fine, Normal and Basic. The layout of the control buttons insures quick identification of the desired functions and easy use of the multifunction interface in operating camera settings. Clearly marked buttons make it easy for the photographer to display and adjust the most important settings, namely ISO, resolution, JPEG quality and file type, and white balance, on one screen, using one button. The top LCD panel incorporates a backlight, which enables the camera to be easily controlled in low light or dark conditions. Box Dimensions (LxWxH) 7.7 x 7.7 x 5.7"
SD15 14 Megapixel SLR Digital Camera (Body Only) is rated 4.4 out of 5 by 9. Rated 4 out of 5 by Anonymous from SD15 EXPERIENCE I use the Sigma SD15 for checking out the possibilities for portrait work. I already know it is excellent for landscape pictures due to the phenomenal color quality. The pictures really pop! I have used Nikon exclusively over the past 50 years. My latest one is the D2x which I use for professional work. The SD15 is an easy transition from Nikon in that the controls, although not similar, are very intuitive. The menu is extensive and easy to learn. I am not sure, at this point that I have a negative thing the say about this camera. In time, there may be some things that I find annoying but the jury is still out on that issue. Rated 4 out of 5 by antonio from Top quality image It's a sturdy camera, with a very nice LCD and an astonishing image quality. But like any other Foveon based camera, you are on Sigma's hands. To find a really good optics may be a problem. My advice is to stick with primes org buy a M42 to SA mount adapter (it will keep the focus confirm and you will be able to use aperture priority and manual modes). I gave 4 stars just for two reasons, the small optical viewfinder. It could be much better. The second one is that the high ISOs are noisy, but since I shoot 99% at ISO 100, this is not a big problem. Rated 4 out of 5 by X3MAN from Best IQ for the price Some reviews on the Internet regarding the SD15 are not really positive. Yet, owing a SD14 (it was my first SIGMA ever) and now the SD15, I can say, based on a real use of the camera, that I have to disagree with most of the negative comments you can read on the Net. Is this camera perfect? No, like any Canon, Nikon, Sony cameras of the same price. Why would you buy it? Because it delivers the best IQ for the price. Period. Rated 5 out of 5 by Anonymous from Many improvements Same outstanding detail and color, maybe even better color right out of the camera. Improved UI, faster architecture (multi shot). Less noise at higher ISO. Still waiting for X3F support on the iPad. Rated 4 out of 5 by Landscape Phtographer from Great camera some caveats The SD15 is an upgrade from the Sigma SD14 which I purchased in 2008. The 460K display is much improved and a magnifying device such as a Hoodman Loupe can now actually be useful in evaluating the image that was just captured. I will use this camera for fine art landscape photography. Like the SD14 as it renders color with an exceptional clarity/trasparancy that I have yet to see with the Bayer-pattern sensors used in almost all non-Sigma digital cameras. When processing the raw images, there is a lot of latitude for uping saturation and contrast without the image looking unatural-this is where the SD15 really shines. Bayer-pattern sensors undergo much more processing so the image can't be quite as succesfully manipulated. White balance is improved- I have yet to see the magenta-green crossover issue that sometimes plagued the SD14. Even with improvements, this is not a great available light camera and performs best when limited to use in the 100 to 200 ISO range. I wish that they had continued to use CF cards instead of adopting the SDHC standard. I highly recommend getting fast SDHC cards. Now if they would just come out with a full frame Foveon sensor. Rated 5 out of 5 by Marcus The Free Photographer from SD15 in 2011. An owner's review. SD1 was announced in photokina last year 2010. That is probably one of the most interesting news since slice bread for hobbyist and people who are not forced to stick with Canon/Nikon due to lens investment. Having given a choice of either to wait for the SD1 or purchase the SD15 was a tough decision however. I decided to go for the SD15 finally and never regretted that decision. SD15 is the latest iteration of the existing Foveon chip (SD1 having a totally different Foveon chip) and that is a long iteration given that the first SDs is SD9 that was launched in 2002. If you have worked on improving the same system for the last 8 years, you get a really good working system. I chose SD15 because the files are smaller, although i shoot in RAW, processing the files and exporting them for upload to my flickr and facebook without resizing is a real time saver. How much time are we saving here? Compared to the latest 16.2 cmos sensor output on the other cam i had and sold off, its 2x the time (MAC mini 2010, LR 3.0). The SD15 have none of the Dp2 weakness since the autofocus is fast and the current available lens with Optical Stability makes the images sharp and usable at low light (a common complain that first time foveon users have). Images from SD1 are sharp and carries that elusive 3d look. I mentioned sharp earlier but i just cant stress enough on how sharp it really is. When viewed in 100% you find no mushiness or those typical fill it in pixels that are typical of bayer sensors. I have long evaluated the image output of the 4.7 mp foveon chip in my Sigma DP2 vs canon/nikon and i am very much pleased with its true resolution and sharpness. I find it appalling that there are so many review sites that shoot in jpeg and upsize the image for comparison, i find such comparison illogical. Upsizing any image above 100% introduces pixelation but 100% view is the true comparison. Arguing on the point that a 4.7 mp is small that therefore its 100% sharpness is not fair is an invalid argument since SD1 with 16mp output still have the same 100% sharpness. As for shooting in jpeg, none of the Sigma owners ever shoot in jpg, maybe reviewers should learn that up before doing a review. Here are other new features in other cameras (NOT in SD15) and often mentioned in reviews and why i don't even want them : - Video : I find camcorders provide more natural grip and usable in long hours. Using video on a camera even on the SLT a55 i had was interesting but nowhere where the practicality of the camcorder. - Panorama : When you have to move and shoot, the images are not usable except in bright day light. Shooting sunset and sunrise produces low quality images. Its so much better to just shoot and join them later on. - Face detection : I find that an average human could detect faces much better without the frustration to wait for the AI to find them - Smile Detection: i find that an average human could detect genuine smiles much better. While it might be useful for holding the camera and shooting yourself, its more of a gimmick. - HDR / DR mode : use bracketing, built in HDR doesn't work on RAW and whats the reason of getting a DSLR again? DR mode doesn't even match the DR of an SD15. - GPS : I need my batteries to work for my important shots, not for talking with the satellite. A similar lessoned learn from using GPS on mobile phones. -Smaller, lighter : Get a compact. The day will come when you can have high quality images on a compact in a pocket, but its not today. If you get an EVIL with additional lens, you would still need some nice bag. - AMOLED/High LCD : Shooting raw also means the jpg showed is just a rudimentary image on the LCD, having a super high resolution LCD is only useful if it saves further energy Features that would be most welcomed and are NOT in SD15 : - Swivel LCD - more AF points - Auto iso to include ISO 50 (more on this later) The buttons and functions on the SD15 are easy to access and comes with a Quick Setting (shortcuts configuration on most popular settings). The layout is not conventional and some features like the flash mode are not where it should be as in other cameras, its only a surprise when u first use it. The only qualms i have on the settings is choosing the focus point as its requires more effort to hold a button while moving the dials than just pressing one button followed by another as in the DP2. The battery life is good for around 400-500 shots and thats pretty usable. I ordered a spare battery anyway since i often bring 2 batteries for my shootings. I focus on shooting pre-wedding (asia) and relationships. The auto ISO might come as a surprise to many, its range being 100-200! But that does not means that it does not work in low light, its does and works pretty nicely as long as its not a moving object and on the condition you get a OS lens. Moving objects in low light is going to be blur no matter what camera you use at this point and for me that defeat the purpose of having high isos that removes too much details in due to its de-noising algo. For shooting lowlight scenery or night scene, you are going to use a tripod anyway! I ordered mine with Sigma 17-50mm OS. In summary, at the current price, its a very good buy for those who wants a camera that captures astounding images or existing Canon/nikon users who wants to see for themselves, what it is all about. Rated 5 out of 5 by Anonymous from Great Image Quality! I'm a pretty avid amateur photographer, and I wouldn't trade any of my Sigma dSLRs for any other camera---especially the SD-15. I especially like the ability to select either a leading or trailing curtain, and the 21 shot buffer is a big plus as well. The only down side to this Sigma and it's predecessors is they're a bit lacking noise-wise in high ISO / low light situations. However, even though the pixel count may be small in comparison to other cameras, the image quality produced is unsurpassed!